A cool but bright day welcomed 15 runners to the Christmas L2SOTM including new runners Melanie, Wendy, Kieron and Louis (all of whom were significantly pessimistic about their running times). Conditions were good, with around half the rest of the runners improving on their times and a spread of only a minute and a half across the runners on a real handicap. Katie managed a storming run to retain the ladies' Most Improved trophy, while Jeremy scored his 5th Most Improved Man to make him the most often Most Improved Man since records began. After the race, we were treated to mince pies and mulled wine, which helped warm us up and gave the festivities a kick start. 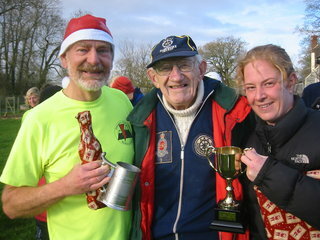 The runners and helpers enjoying mulled wine and mince pies after the race. 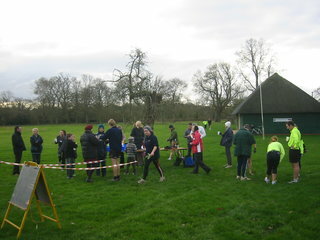 Thanks go to Jeremy and Maggie for the pies and wine and Jeffrey for being barman; to Maggie and all her helpers for the timekeeping; to Jack for marshalling and presenting the awards; to the Goulds for putting the signs out; and to the Cricket Club for allowing us to use their facilities.